Award • Governing Magazine salutes Liljenquist for efforts to reform pension system, Medicaid. Tribune File Photo State Sen. Dan Liljenquist was named Governing Magazine's legislator of the year, based mainly on his work to reform Utah's pension system and Medicaid program. Scott Sommerdorf | Tribune file photo Sen. Dan Liljenquist, R-Bountiful, was named Governing Magazine's Legislator of the Year for the nation. 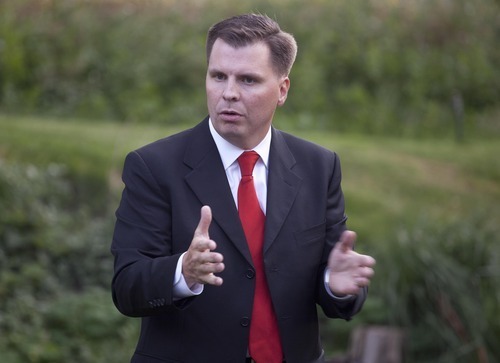 State Sen. Dan Liljenquist was named the top legislator in the United States by Governing Magazine, a national publication that covers state and local government. 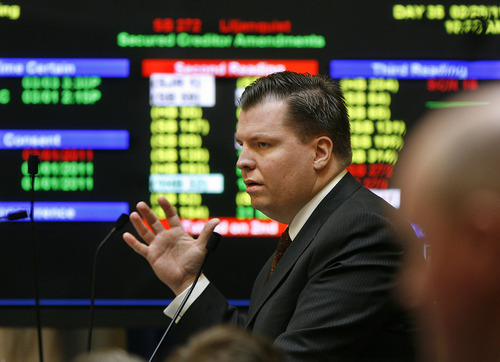 The Bountiful Republican was recognized for his efforts to reform Utah's public employees pension system in 2010, as well as sponsoring legislation to reform Medicaid during the session earlier this year. "It's pretty cool," Liljenquist said. "I'm clearly delighted with the recognition, and I really think it is an award for the entire Legislature. We took a hard issue, we took a tough vote and it's something to be proud of." Governing Magazine picks a handful of public officials to recognize from various segments of state and local government. Liljenquist was the legislative recipient. "In other places, innovators like Dan are relegated to the back bench. Here, smart ideas carry the day," said Senate President Michael Waddoups, R-Taylorsville. Pension systems across the country suffered a serious blow during the recent recession. Utah's system faced a projected $6.3 billion long-term unfunded liability, meaning the state would have to pay more for benefits for retirees  up to $400 million more annually by 2016. Liljenquist's reform bill closed the defined benefit system to new hires and created a hybrid for those entering the state workforce, where they can contribute to a defined-contribution plan, like a 401(k), or choose a significantly reduced defined-benefit plan. Employee unions adamantly opposed the bill, arguing the pension plan would recover as the economy did. The bill eventually passed on a near-party-line vote. Democrats said Liljenquist did a great job selling the claim that pensions were a problem, but it was false. "The real fact is that the Utah public pension system was one of the most solid in the country and was consistently delivering well above predicted returns during the recession," said Rob Miller, treasurer of the Utah Democratic Party and a constituent of Liljenquist's. "We commend the senator on being such a great ideological salesman, but because the system has been so gutted Utah may now become a training ground for other states, where better retirement is offered." Since the pension reform bill passed, Liljenquist has worked with legislators from close to 40 states tackling the same problem. He has also tried to enact reforms in Utah that would make the Medicaid system, which provides health care for the poor, a managed-care system instead of a fee-for-service model. Those reforms are contingent on approval from the federal government. Liljenquist has not been shy about his interest in a potential run for the U.S. Senate against six-term Sen. Orrin Hatch. He says he will make his decision to run by the end of the fall.